In this section of our site you will find the best products for screen printing. You will be able to purchase a wide range of silk-screen emulsions with which you can begin any creative idea and customization. 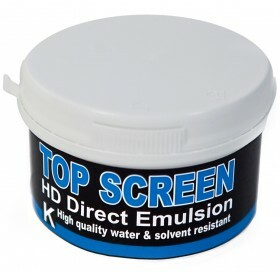 The screen-printing emulsions present in this category are of the highest quality and are very simple to use. Suitable for water based, solvent and plastisol inks, they can be used by DIY hobbyist or professionals. This type of screenprint emulsion can also be used without ultraviolet rays. On our website you will find video tutorials and information manuals about exposure times and techniques to stretch gelatin on the screen printing frame. Visit the section of Screen printing machines and Kits. 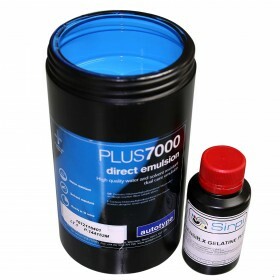 Screen Printing Emulsion Plus7000 1000ml is a very high quality (HD), medium/high solids emuls..
Ready to use Screen Printing Emulsion Plus7000 Top screen (250gr) is a very high quality, mediu..
Ready to use Screen Printing Emulsion Plus7000 Top screen (500gr) is a very high quality, mediu..